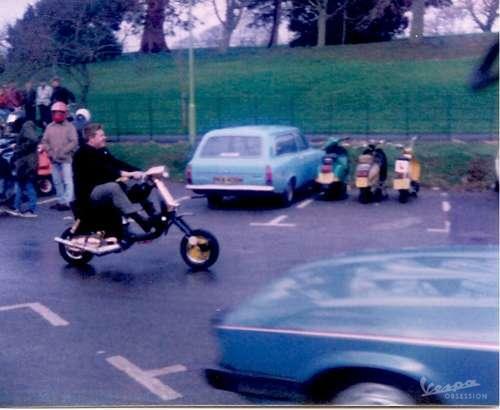 just found a picture of the first ever Vega I saw a Knaresborough scooter rally in 1984.
it was the sighting of such a strange quirky little machine that led to an almost (at times) obsessional love of with these much under rated machines. almost 30 years on, I'm still mad on them. It's funny how these things stick in your mind, I spotted my first Vega on Skegness sea front in 82. I didn't even know they existed until one went buzzing past as I sat watching the scooters go up and down the road. It took the club's no1 to tell me what it was and from that day I wanted one. I'm not too sure on it's colour these days but if pushed i'd say red. Like I say how things stay with you, at that time there were loads of tuned up custom painted chrome plated machines there , but I can't recall one of them (perhaps a dyrospeed ) might be the exception. Not sure of the year but my first sighting of a Vega was at a Scarborough rally in the early 80's. Completely chromed and owned by Guido Pastorelli from Armandos in Sheffield. The scooter looked awesome. It wasn't until the mid 1990's that I got my hands on a completely blue Cometa for free from a farm in Gloucestershire where I lived at the time. Since then I've had a succesion of Luna line machines. Well as I have a min - I more heard about Vega's than saw one - as a 15 year old mod boy I used to hang around a local scooter boys garage and cadge the occasional sprint down the road on the back of his GP200. Anyway I clearly remember him telling me stories of these odd little scooters that looked like next to nothing but that could be souped up so much that they could give the local fizz riders a hell of a shock and I guess it was that which really got me interested in the idea of owning a Vega. I don't suppose it really matters that the reality is somewhat off what I was told all those years ago. At the end of the sixties when the the whole Mod thing was fading away I was moving towards the scooter club competetive thing and fancied a Vega for events. I bought a second hand one and subsequently moved that one on to fund another Series 3 project but missed the Vega so my brother and I bought two matching yellow Ochre Vegas from Comerfords in Thames Ditton, Surrey. I then went up to College and it lasted me a year before I decided the journey back to my folks called for a bigger capacity scoot. A few years ago I bought another, sold that one on but now I've got the 1972 Grass Track championship winning Cometa raced by Alan Keane. Probably a keeper!. The first one I saw was in a local bike spares shop window in the green colour,I had to stop and look as I walked past every day to work because it looked so cool and funky for 1980.The next ones I saw were chromed and fancy paint jobs at Scarboro' 81 and I always had to stop and look at them amongst all the other scooters although I was riding smallframe Vespas then.I finally managed to buy one in 89/90 and did it up for my then partner but when she passed away I sold it regrettably but always hankered for another ,until buying a Lui about 5 years ago.It's strange as well that any cutdown Ser 3 I have done I have always fitted Vega legshields as they just look right . Passed my test on one in 1982, then actually bought it in 1983 and had it for a couple of years, selling it in 1985 to help towards the deposit on my first house. VMB70J, if anyone ever sees it. I converted it to a 125. I grew up in the South Norwood area of south London in the 60's where there were a lot of Lambrettas at the time (my older brother had a GT200) I was always going to own a Lambretta. I used to catch a bus with my mother to visit my sister in Purley and we used to go past the Trojan Works where new Lambrettas were being unloaded and lined up outside. I particularly remember seeing the bright new colours of the GP's and Luna models around 1969 (I would have been about 7). Having owed and ridden Series 3 Lambrettas since 1979 I had always wanted a Vega nearly buying one for £25 in 1981 but it was sold just before could get there. Vegas are few and far between in Norfolk so I never finally got round to getting one, until 2012 when my wife bought me a basket case project for my 50th birthday. Complete and ridden last summer it was worth the wait, they must be the most fun you can legally have at 40mph.